The cylinder head sits atop the Cylinders and consists of a platform containing part of the combustion chamber and the location of the valves and spark plugs. 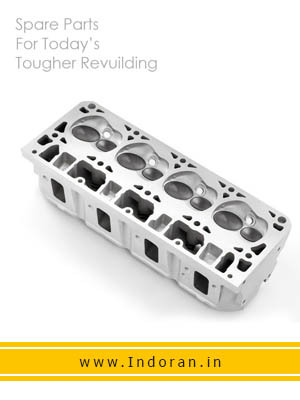 the cylinder head is a key to the performance of the internal combustion engine,as the shape of the combustion chamber,inlet passage and ports determines a major portion of the volumetric efficiency and compression ratio of the engine. these are usually made of grey Cast-Iron and aluminium. these heads are suitable for wet-sleeved and non-sleeved engines.these materials provide specific uses like heat conductivity,low weight for aluminium heads.